I’d like to see Open in Place support in the share sheet. This feature is already available when browsing the DEVONthink To Go location in the Files app in iOS 11. When tapping “Share” on a document, supported apps will offer an “Open in” action (opposed to the standard “Copy to” action). 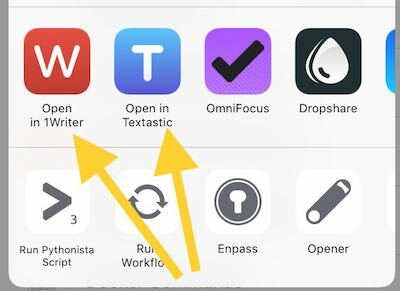 In my case, markdown files can “Open in 1Writer” or “Open in Textastic”. This opens the file directly in the third-party app without any duplicates and without any round-tripping. I’d prefer to browse my DEVONthink database using DEVONthink To Go, but this awesome feature has me using Files app instead. Can you bring this feature over to DEVONthink To Go? How to access items in DTTG with other Apps? It’s already on our list for improvements. +1, that will be a fantastic feature. Follow-up question after some research: Have you seen the Open-in-Place feature in any other “files-like” app except for Files? The git client. Sometimes it says Copy To, but it really performs as an Open In. Both Textastic and iA Writer show that the file was opened from an external storage provider. PDF Viewer by PSPDFKit GmbH supports Open in Place. The only one I’ve found. This is very underutilized sadly. +1 for this. Any approximate ETA? Sorry but we do not give timeframes - for your benefit and ours. Please add this! It is frustrating to be able to find an item in DTTG via search or item link, but not be able to then edit it starting from within DTTG. Going to the Files app to do so is really clumsy and defeats the purpose of DTTG’s great features. Box App - MS Office files can be opened/modified directly in Excel, Word and PowerPoint - no ‚open in‘ no duplicates, etc. Noted but please see: How to access items in DTTG with other Apps? We should be able to read the files without duplicating (copying) them. The File app is not capable of searching the documents. If I have to use the File app, why do I need DTTG in the first place? Because of this missing feature, I only use my DT databases for reference files and documents I’m “done” with and need to archive. With Open In Place, I’d actually be able to do “work” in my DT databases, saving changes as I go. Which is how I used DT on the Mac. But Im all in on iOS now. So I have to split my work between iCloud (active projects) and DEVONthink (archived projects).